The Type-62 is a gift Soviet Rank IV light tank with a battle rating of 6.7. It was introduced during the 2016 "War Thunder Chronicle" that took place between 23 December 2016 to 16 January 2017. It was obtained via completing 10 tasks as part of the event and is no longer obtainable. While playing the Type-62, it is important to stay hidden from your enemy at all times and avoid going head-to-head with enemies that have noticed your presence and are focusing on eliminating you. The paper-thin armour on the Type-62 cannot effectively stop any shell, and, unless you're facing the British, a hit will likely result in the HE filler of the shell knocking out most of your crew / detonating your ammo racks. So it is recommended to use flanking tactics on larger maps, while staying hidden behind terrain features such as hills, trees, even in ditches, while on smaller city maps it's recommended to stay behind piles of rubble, houses, even your teammates, to avoid the enemy seeing the Type-62 before it has the opportunity to disable their gun or destroy them. Ammo racks of the Type-62. With it's excellent mobility, the Type-62 is great for getting from point to point and setting up ambushes. However it is important to note that the reload rate is around the same or even slower than most enemy tanks, so making your first shot count is always going to determine whether you survive the engagement or not. Aiming for the turret or ammo racks of the enemy are great options, as they usually ensure ammo rack detonations or that the enemy won't be able to fire back at you if not. Also note that going on rough terrain and over piles of rubble is not recommended while at risk to be shot at by the enemy, as the gun takes a very long time to adjust in the vertical. With the the HEAT-FS shell, staying at range is also possible, as it is much easier for you to hide your tank from the enemy while not losing accuracy and penetration of the HEAT-FS shell. When facing heavy and medium tanks of the enemy, try to knock out their gun to allow you to get a clear shot of their side, as the stock shells for the 85mm gun on the Type-62 can't reliably penetrate tanks such as the T29 and Tiger II (H) up front. However, with the HEAT-FS and APCR shells unlocked you'll be able to deal with heavily armoured tanks easier, so getting those early on is a must. 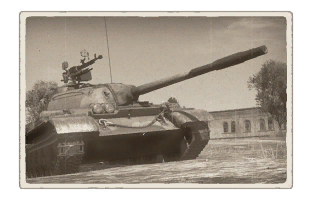 The hardest tanks to destroy in the Type-62 will be the T29 and Tiger II (H), as APHEBC and APCBC shells cannot penetrate these tanks from the front. 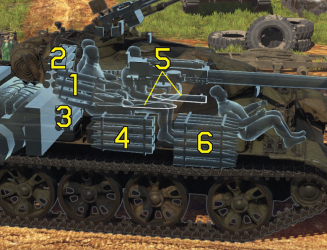 When facing against these tanks, your best option is to get their ammo racks or turret crew from the side while they're busy dealing with your teammates, or, if they see you, relocating without them seeing you and getting them unawares. With the HEAT-FS shell it is possible to even penetrate the King Tiger's upper front plate if they underestimate you and don't angle their hull. After World War II, China stayed in a state of conflict as part of the Chinese Civil War, pitting the Chinese Nationalists against the Communists. The Communist Party were victorious and they established the People's Republic of China (PRC) in 01 October 1949. In 14 February 1950, the Chinese signed an alliance treaty with the Soviet Union, which allowed the Soviet Union to support China economically and militarily, leading to many money loans and arms trade. One of the weapons given in arms trade was the Soviet's new main battle tank, the T-54. The tank became the basis of the Soviet's aid in building up China's tank manufacturing facility in 1956, starting with Soviet-made parts before transitioning to Chinese parts. The T-54 tank design was then accepted into the Chinese People's Liberation Army (PLA) in 1959 as the Type 59. While accepted as the main tank of the PLA, the Type 59 was deemed too heavy for some of the terrain and infrastructure on China. A light tank design was requested in the late 1950s, leading to the formal development process in 1958. 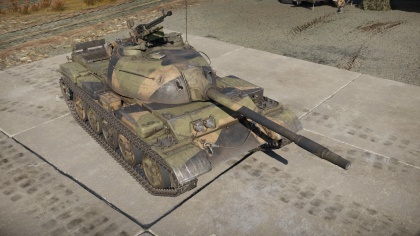 The first prototype was produced in 1960 as the Type 59-16, which was essentially a down-scaled Type 59 with an 85 mm armament, thinner armour, and smaller profile. Trials commenced until December 1962, when it was accepted as the Type 62, production name WZ 131. It was then put into production in 1963 with roughly 1,393 tank units produced until 1989. The Type 62 light tank was primarily stationed with military units in Southern China where the infrastructure is not as sophisticated. However, the Type 62 would not see its first usage in Chinese hands. A number of them was supplied to the North Vietnamese Army during the Vietnam War, which they used against America and South Vietnam until the end of the war in 1975. The Type 62 then saw use again in 1979 in Vietnam, but mostly in Chinese hands in the Sino-Vietnamese War. However, the Type 62 suffered due to anti-tank weapons such as the ubiquitous rocket launchers penetrating right through the thin armour. The overall consensus of their experiences in Vietnam was that the Type 62 not suitable to act around as a normal tank due to its light armour and armament, and was relegated to recon and fire support. An upgrade program commenced on the Type 62 led to the Type 62-I variant. The program was based on the experiences in Vietnam, leading to many upgrades such as a laser range finder, a shield for the exterior-mounted 12.7 mm machine gun, and protection against HEAT rounds. The second modernization program began in 2000 to upgrade the Type 62-I into Type 62G which improved the armour layout and turret design of the tank, as well as adding smoke dischargers and a new 105 mm main armament with a modern stabilizer and fire-control system. The Type 62 stayed in the Chinese service up until early 2013. The Type 62 also saw exportation to many countries, ranging from Albania, Banglades, Cambodia, Congo, Mali, Sudan, Tanzania, Thailand, North Korea, and Zaire. In some cases, such as in North Korea, this led to confusions between the Soviet's T-62 main battle tank due to the labeling of the Type 62 as simply "T-62". Information of the Type 62 in these countries are rather limited or unknown, though most of them seem to still have them in reserves today.